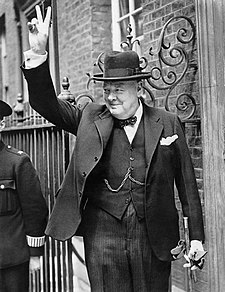 Sir Winston Leonard Spencer Churchill KG OM CH TD FRS PC (30 November 1874 – 24 January 1965) ek English politician rahaa, jon ki World War II ke time United Kingdom ke Prime Minister rahaa. He was also a soldier, journalist, and author. He won the Nobel Prize for literature. Uske janam 30 November, 1874 ke Blenheim Palace, Oxfordshire, Englandme aur maut 24 January 1965 ke bhais rahaa. Uske palwaar dhani rahaa aur uske pitaji, Lord Randolph Churchill, ek politician rahaa aur uske maiya ek American rahis.